Exhibitors : 37 countries 400 companies We displayed panels which introduced public and private missions, exhibitions and the "Products & Technologies". In cooperations with Heat Pump & Thermal Storage Technology Center of Japan, they demonstrated the principle models in our booth and they are very popular. 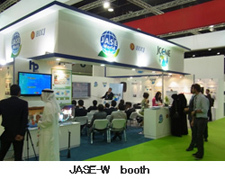 At the co-presentation corner with JCCME(Japan Cooperation Center for the Middle East) and NEDO(New Energy and Industry Technology Development Organization), JASE-W members have presented their technologies and products, and appealed Japan's advanced Energy efficiency. 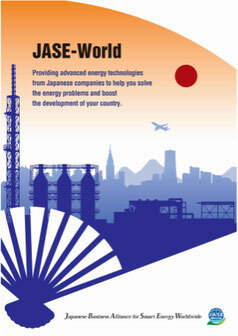 Presenters: Heat Pump & Thermal Storage Technology Center of Japan, Mitsui Engineering & Shipbuilding Co,.LTD, Hitachi Zosen Corporation, Kawasaki Heavy Industries, LTD., Kaneka Corporation and so on.